> Aim, fire & score points! Toss your popcorn onto guests while you sitting in the theater! An addictive, cool game! > Super fun cooking games! Use the microwave but make sure your popcorn doesn’t explode! > Popcorn Makin’ Mania! Pop, season, decorate & gobble up this tasty snack! Start the mania by pulling kernels off the corn cob! Track progress & points with the sidebar, Now pop it up! Choose between 4 cool methods like: microwave, pot, pan & popcorn machine! Cookin up popcorn is fun! Tap the kernels as they cook in the pot and watch them fly up! Careful not to let the popcorn explode while it’s cooking in the microwave! Give your popcorn a little flavor when you add seasoning from a delicious selection of 8 different toppings! Give your popcorn bucket personality when you decorate it with different styles of hair, eyes, mouths & more! 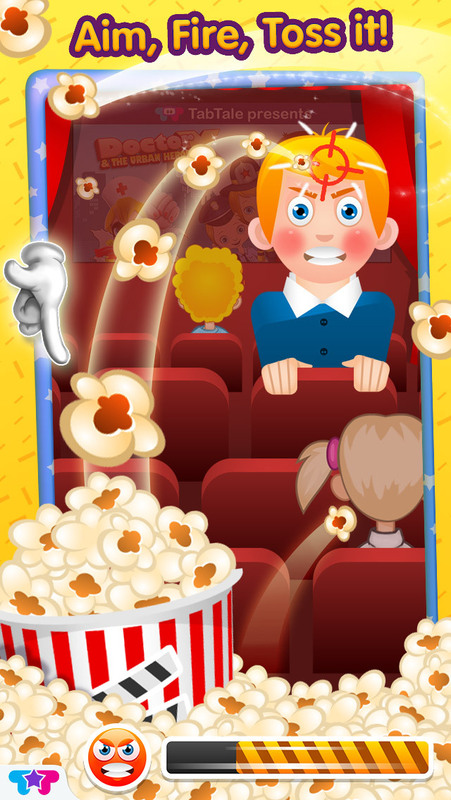 In this popcorn mini game, sit in the theater, take your popcorn and aim them at another moviegoer! Score points as you pelt other patrons- they’ll even give you an angry look when you hit them! > Pull kernels from the corn cob to get your popcorn ready for popping! > Slide to choose from four different cooking methods: microwave, pan, pot, & popcorn machine! > Watch your progress and your score with the progress bar! > Stir your popcorn to watch it color and give it some flavor! > Tap options to decorate your popcorn with choice of bucket styles, mouths, eyes, hands and more! Decorate your cup and straw too! > Take a picture of your tasty popcorn and show it to family & friends once you’re done! > 4 different sizes of buckets to begin your popcorn fun! 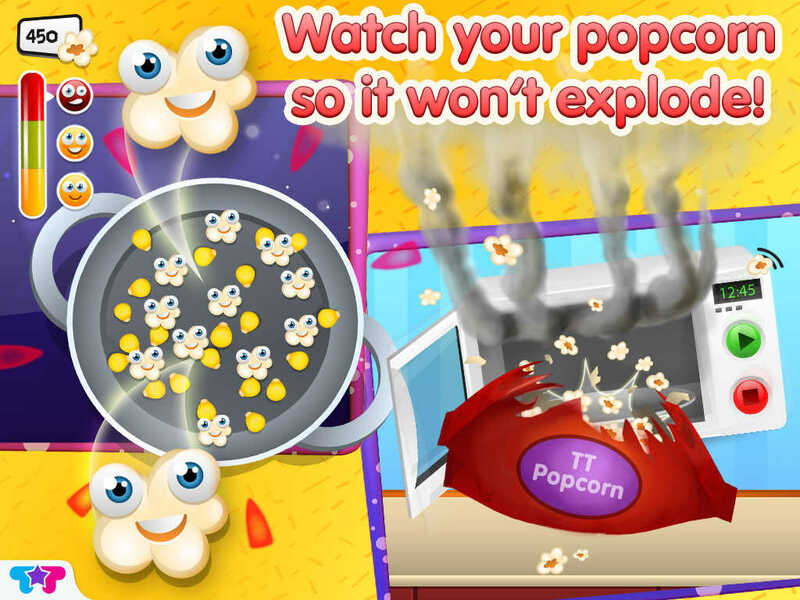 > 4 cooking games for popping the popcorn: Microwave, Pot, Pan & Machine! 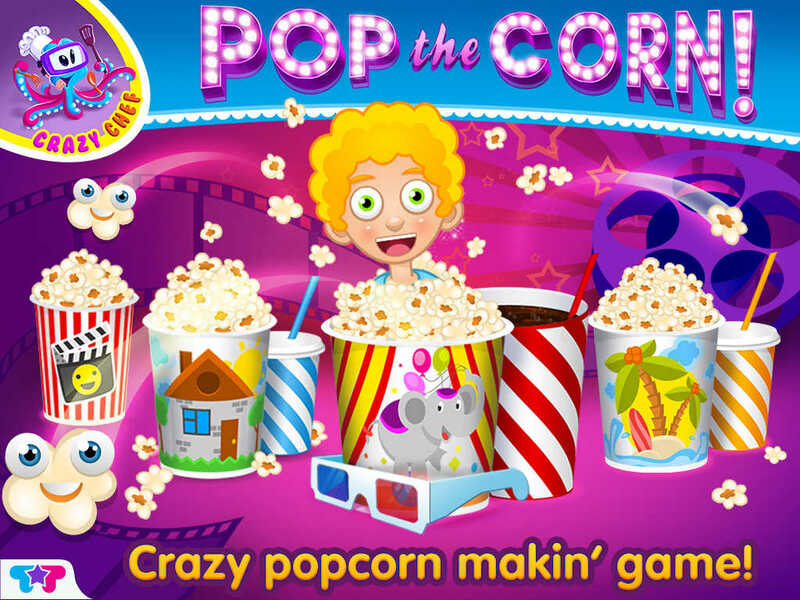 > 4 extra mini games: Pulling Kernels, Toss The Popcorn, Poppin’ in the Pot & Microwave! > 8 different varieties of flavors to season your popcorn! > 11 different styles of cups to choose from! > 20 straws to select and personalize your cup! > 10 buckets to choose from to give your popcorn some personality! > 50 different ways to decorate your bucket: mouths, eyes, ties & more!